BFAP aims to reclaim and improve N Williams District Beech-Failing Alley with special focus on placemaking, pedestrian benefit, and environmental stewardship, while advocating for effective relative policy citywide. "Greening and activating" alleys is a way of reclaiming neglected city infrastructure, with special focus on placemaking, pedestrian benefit, and environmental stewardship. This renewal is accomplished through vital improvements like benches, bicycle racks, art, garden plots, plantings, surfacing, watershed management, and other features that create a park-like setting. These improvements can also bring about neighborhood retreats, bicycle throughways, ADU communities, or small business and cultural districts. While this movement is progressing in cities across the country, the City of Portland Oregon has yet to join the effort. Our project aims to green and activate our neglected and highly public alley, while advocating for relative policy citywide. Since beginning our mission March 2016, we’ve gathered $4,670 in-kind assistance. 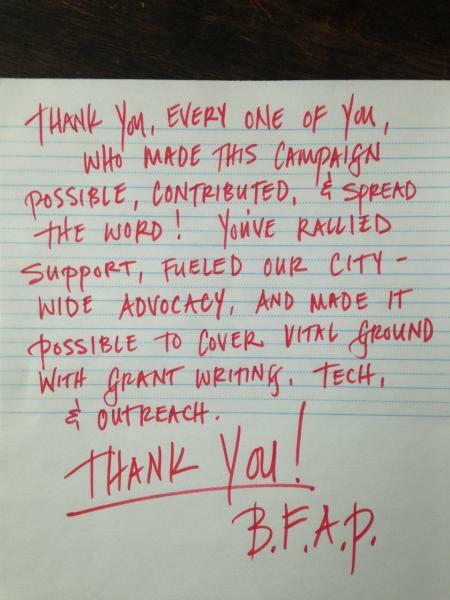 We're working to raise $10,000 toward the cost of professional grantwriting, outreach and technical services for 2016. We’ve carefully identified, researched, and set our sights on five separate grant opportunities available in the next six months. Each of these grant programs focuses either on help advocating for policy change, or funding for activities in keeping with our improvements onsite. If this crowdfunding campaign surpasses our goal, we’ll share up to $10,000 additional funds with one or more lower income residential neighborhood groups for greening and activating improvements to an alley, or similarly neglected pedestrian-shared roadway; as they meet benchmarks such as cooperative clean-up. See our project updates to learn about sister projects and new in-kind contributions. Currently, if a group of Portland neighbors wants to green and activate an alley or similarly neglected pedestrian-shared roadway, it's prohibitively complicated and expensive: with little local precedent, no clear policy to facilitate their effort, and no city incentive for neighboring developers to assist them. Just the professional surveying of a Portland alley can cost over $3,000. The cost of grading and park-like hardscaping of a Portland alley can easily surpass $200,000. The Beech Failing Alley Project is a group of neighbors inspired by the growing movement to green and activate alleys, while facing these local challenges. We're working to add Portland to the list of cities redefining neglected infrastructure nationwide. This is the last update of the Beech Failing Alley Project. As organizer of the project since March 2016, I’m glad to say that our goodbye and conclusion includes a hello and introduction. We founded BFAP to explore and incubate programming for community-led development encompassing environmental stewardship and community benefit on underutilized rights of way. For nearly two years, we testified to Portland government that development of this kind holds tremendous potential to foster more livable housing options, connection between neighbors, small business opportunities, remediation of climate and urban impacts by reducing heat-trap and runoff; and to increase green space, connectivity, and sense of place. Our research, outreach, and testimony grew from an interdisciplinary wealth of knowledge on techniques and precedents related to this planning model – and through persistent discussion of their challenges and most successful approaches from a community-led perspective. As fitting programming does not exist in Portland, and as neighbors in the Boise Williams corridor, we aspired to demonstrate this model in an area where rapid and sometimes contentious development had set the stage for much needed engagement between the city, longtime neighbors, recent transplants, and commercial developers - where the array of stakeholders is especially complex, land-use opportunity is varied, and dense public experience would be possible. We were honored by the robust support that grew our effort. Thank you, all of you. We took great joy in our community partnerships; and we succeeded in creating the largest internet archive of resources related to the movement – including, as of yet, the only pedestrian-shared street signage featuring wheelchair use along with cycling and play space, publicly available online – now downloaded over a thousand times in less than a year. In January, BFAP directors agreed: having no grants awarded as large scale development in the Boise neighborhood marches forward, and with still no city guidance to either incentivize or restrict development attributes in a way which might rally adjacent commercial stakeholders - our project could not proceed. Directors further agreed that without my personal participation, the project did not have the capacity to continue community outreach, and unanimously voted to retire the board. This is where the introduction comes in. It’s my pleasure to report that BFAP is passing the torch to Portland Global Shapers. The Shapers are a local non profit dedicated to community action. I am greatly inspired by their skills and motivation. Click here to learn more about their projects, how the outreach and archive BFAP initiated will grow through their efforts; and feel free to connect with the project lead Frankie Lewington, or their Vice Curator Laura Mortara. Again, a heartfelt thank you to past project supporters and to Portland Global Shapers. I look forward to any future progress, and I use the last word of my sign off to personally urge Portland City Council to finally give neighbors effective programming that unlocks community-led development on underutilized rights of way. This Beech Failing Alley Project update has been a long time coming. I’m Melinda, the project organizer, and I’ve been on hiatus since July. Unfortunately, new news related to BFAP and Portland alley policy is less than ideal. Although BFAP worked nearly a year and a half (including reconvening after disruption by a PBOT representative) to secure a cross-sector meeting with key city staff in June, there hasn’t been related progress within city statutes or pilots. PBOT did roll out some new alley policies this summer – ones that are essentially contrary to our and other community members’ repeated testimony and requests regarding heat trap, run off, and environmental and community benefits. Of particular note is that the city requirement for residential development adjacent to alleys to trigger 500 sqft concrete paving at the alley’s entrance is now codified. ADUs may also trigger such paving. Persons with input are encouraged to contact Commissioners' offices directly. BFAP has had additional challenges in recent months. Other than a community grant by the Boise Neighborhood Association to boost our spring collaborations and June event, none of our grant applications for funds to assist environmentally and community friendly improvement to the Beech Failing Alley or outreach were awarded. An impending challenge, my personal capacity to organize for the BFAP project will finish by January 2018. Persons wanting to participate in efforts for environmentally and community friendly improvements to alleys and other pedestrian-shared rights-of-way are encouraged to contact me during December via upstairs@alleyactivation.org for information and networking. Some of the positive products of our springtime partnerships were treated with disregard in subsequent months. A number of the honeycomb planters crafted by Oregon Tradeswomen were soon broken by car tires of careless drivers pulling too close to private fences; and the benches crafted by Oregon Tradeswomen disappeared by autumn – indications that the transformation of significant permanent improvements is needed to change the way drivers and community member use and treat this public space. The pothole and erosion repairs implemented by Scott Sutton have stood up well to alley traffic and autumn rains. The art installations created by Amanda Jagerman, inspired by the architecture of Jefferson High School, the Hill Cupola of Dawson Park, and the historic Vancouver Ave First Baptist Church, continue to enliven the alley and spark conversations amongst pedestrians. Yet, the brightest spot to report is beyond Portland: The broad movement for smart alley activation and development had a rush of impressive progress in the past year. The BFAP designed woonerf icon has now been downloaded over 700 times in eight months! And, the number of media posts added to alleyactivation.org for 2017 fast surpassed the number which were painstakingly searched to post to the site for 2014, 2015, and 2016, combined. Yes, combined! While early trendsetting cities and areas have kept up their innovative work; some of the most inspiring projects and pilots are happening in places you might not expect - such as Wichita, Kansas; Charlevoix and Kalamazoo, Michigan; Sheboygan and Oconomowac, Wisconsin; Warsaw, Indiana; Cedar Rapids, Iowa; and McCook, Nebraska. When BFAP formed in early 2016, we asserted that the City of Portland was falling behind a smart national movement. As that movement pushes ahead, the City of Portland is now further behind than it was two years ago. While the future of our specific project and local policy is uncertain, we continue to hope Portland officials will be spurred by the full steam ahead action happening nationwide. Happy holidays, and good wishes to everyone in the year ahead! DJ Anjali and the Incredible Kid are going to help bring the love. Some of you know they got their start at May Day celebrations more than a decade ago before going on to fire-up local radio waves and dance floors with their cross-cultural joy like no others – and recently gracing the pages of GQ India! ‘So cool they're going to spice our party with their records. The Good in the Hood Parade is happening nearby in the morning, cheer it on! This is a family-friendly picnic and hangout, bring family and friends. Our alley is dirt and gravel, consider taking an old picnic blanket or seats. Bring a picnic, or buy a super delicious meal right in the alley from the adorable Whole Bowl Truck. Not hungry? Gather around City Repair’s mobile tea house and partake in tea with a spoonful of creative placemaking! Enjoy the restoration juniper planters and benches that Oregon Tradeswomen and Sustainable NW Wood made happen for this community effort. What else? Kids needed: We have an asphalt pad in our alley, crying out for chalk drawings. Also, do you know how to sprinkle happiness? Petal toss! Beautiful dried flower petals have been donated by sustainable Flyboy Naturals in Myrtle Creek to add a little magic to our event. Kids, please toss and sprinkle as needed! Check out what neighbors and KairosPDX students planted to replace the weeds, and the art installation that artist Amanda Jagerman worked with KairosPDX students to create on badges cut by ADX fabrication. If we’re lucky, the KairosPDX and Scout Books zine “Our Dream Hood” will be hot off the presses to see. Also take a look at how artist and ecologist Scott Sutton repaired and adorned some of our potholes using rubble, Oregon Decorative Rock donated crushed rock, and local mineral pigments. Added fun – ever wonder how Portland games company Recreation Dept got going? Well, their crafty prototypes had to happen first; Corn-hole and Ladder-ball to be precise. You can see and play Recreation Dept’s early prototypes in the alley. We'll have a bocce set on site, too. And last but not least, meet people who like the idea of Portland alleys and unimproved roads bringing more thoughtful housing, place spaces and plazas where neighbors meet – instead of potholes, mud, or concrete. Our spring has been bustling with more than cleaning up our alley and building partnerships. We applied for two small grants to help with the party and partnership projects (Thank you so much Boise Neighborhood Association for awarding us assistance!) and two big grants toward capital improvement of our alley in keeping with our mission (fingers crossed!). We got mention in Portland Monthly, the savvy mag that chronicles, challenges, and celebrates Portland, inspiring readers to explore and shape the city we call home. Also, Commissioner Eudaly posted about alleys and BFAP on facebook, 6/13! Thank you Commissioner Eudaly for diligent community-focused advocacy of all sorts. Many of you may remember when, in spring 2016, we began asking city government for a cross-sector discussion of why community-based livable capital improvements on and adjacent to Portland alleys and unimproved roadways couldn’t gain traction, and possible solutions... Mayor Hale’s team tried to convene that discussion; but it took over a year of community squeaky wheeling, plus nudges from Commissioner Saltzman’s team, to make it happen. Finally, this week – two days before our block party, a meeting is scheduled including leaders from Portland City Bureaus, BFAP, the Boise Neighborhood Association, the Southeast Cooper Corridor Project, the Concordia Neighborhood Association, ELM Strategy and Research, KPFF Civil and Consulting Engineers, Owen Gabbert, PSU College of Urban and Public Affairs, Portland For Everyone, the Trust for Public Land, the Urban League, and other groups. We’ll be sure to keep you posted. In this time of often upsetting and divisive current affairs, programming for community-based development models that expand conversation, cooperation and amenities between neighbors can be a step towards more harmony. Thank you to all of you whose interest and encouragement has kept building the momentum – and ‘hope you can picnic with us in the Beech-Failing Alley next Saturday 2:30 – 5:30p!!!!! To riff off March 2016 written testimony by Professor Ethan Seltzer to the city on our effort - rethinking alleys matters because livable gathering places in the heart of city blocks sparks neighbor-to-neighbor engagement, and cities grow healthier with more person-to-person interaction in public spaces full of life. BFAP is at the nucleus of an area impacted by a past lack of municipal support for community-based development, and where the need for inspiring engagement among neighbors new and old is particularly acute. Some of our favorite organizations and companies in town are making multiple community activations possible in the alley this spring, culminating in a block party at the Beech-Failing alley June 24, 2:30p to 5:30p. You’re invited! Check out our lead-up and the party specs below. Kindergarten students have collaborated with artist and educator Amanda Ichihashi Jagerman to create a public art installation with fabrication help from ADX Portland. First grade students are urban-gardening in planters built by Oregon Tradeswomen from Sustainable Northwest Wood restoration juniper during two field trips. Second and third grade students are meeting the neighbor longest residing adjacent to the alley at the home of her family history going back over 60 years for a storytelling field trip - and envisioning better future neighborhoods for a zine to be printed by Scout Books. The entire Kairos Academy student body is contributing material for a time capsule on the Beech-Failing block, to be covered with a public chess table. Thank you, KairosPDX, Amanda Ichihashi Jagerman, ADX Portland, Oregon Tradeswomen, Sustainable Northwest Wood, and Scout Books. Scott Sutton, ecology-focused artist and educator, is lending pollinator stewardship to the effort and using land-art to address erosion impacts, with material help from Oregon Decorative Rock. Thank you, Scott Sutton and Oregon Decorative Rock. Cheer the Good in the Hood Parade (http://www.goodintheneighborhood.org/schedule_of_events.html) that morning, then join our party any time 2:30p - 5:30p to celebrate community-based development options for infrastructure like alleys with picnicking, music and art installation in the right of way. The City Repair T-Horse and DJ Anjali and the Incredible Kid will rally; and another hearty thanks from us to them. And don't forget to get more Good in the Hood later at Lillis Albina City Park, nearby! After twelve months of hurdles, persistent engagement, and written testimony to the Portland Bureau of Transportation, BFAP Chair Melinda Matson was welcomed by the office of Commissioner Dan Saltzman to meet with several key personnel from Portland Bureau of Transportation Right of Way Programs and the Livable Streets Strategy, in February. This is a very grateful shout-out to Commissioner Saltzman’s team and these new PBOT contacts for their meaningful attention to our input, advocacy, and the resource archive we built at www.alleyactivation.org. In this time of concerted local attention on transportation funding and affordable housing, the meeting was an opportunity to personally remind key team leaders that livable alley development is a means to auxiliary pedestrian connections, safe school routes, and affordable green housing. Melinda pointed again to $16 million the Dubuque IA Green Alley Program has culled from state and federal sources in 16 years, and to affordable green housing incentivized by the Austin TX Alley Flats Project, which also encourages neighborly interaction by turning accessory residential frontage toward the heart of city blocks. We believe Portland would make great waves if it became the first city in the country with livable alley programming to facilitate watershed stewardship funding in tandem with incentives for development of green, affordable, accessory housing - and we’ll keep advocating for that. We look forward to watching for new advances being made by PBOT Right of Way Programs and the Livable Streets Strategy - and sharing community input more directly with those teams. Soon after the meeting, attendees helpfully facilitated an official letter of support for BFAP from PBOT Director Leah Treat. Thank you Director Treat! Our project is also appreciative to have recently connected with ELM Research and Strategy for assistance with our spring grants applications and general guidance moving forward. ELM is distinguished in crafting interdisciplinary, collaborative approaches to achieving enduring results - and in bringing social science and business expertise together to help clients succeed while staying true to their core values. BFAP is lucky to have their support. Thank you so much ELM! Our plans for a community event in June are moving forward with a slew of awesome partnerships including equity-focused Kairos Academy, artist and educator Amanda Ishihashi Jagerman, Oregon Tradeswomen, artist and ecologist Scott Sutton, Sustainable Northwest Wood, and others. ‘More on that next month. Please check back in April for news on the upcoming community event and other public activities we have in the works. It’s a tumultuous winter in current affairs; and that has further stoked our and others’ actions toward basic policies that build both community and sustainability. January 17, BFAP Board-chair Melinda Matson presented to the High School Environmental Leadership Project. HELP is working to raise the bar on local policies for climate education, limitation to temperature increase, and preparedness for climate impacts. We’re proud to work with these ambitious young activists every time we get the chance. There’s also inspiring news from our sister project, SCCP. Brentwood-Darlington’s Southeast Cooper Corridor Project aims to create a park-like boulevard from a ten block length of severely neglected SE Cooper St - and has been chosen as a Portland State University engineering capstone project! A team of engineering students will turn their skills to engineering conceptual plans for the Southeast Cooper Corridor Project. Congratulations Brentwood-Darlington! Meanwhile, BFAP is seeking grant funding to administer a 2017 Livable Infrastructure Research and Activation Team of Portland State University Master of Urban and Regional Planning graduate interns, working with partner organizations and BFAP to rapidly build capacity and momentum for the issues addressed by BFAP to the City of Portland. To further our outreach and partnerships, BFAP has become an Interwine Alliance Partner. Take a look at their good work. BFAP also continues to advocate directly to city government, and seek grant funding for activation and on-site improvement to broadly demonstrate alleys as assets for building community and sustainability in comprehensive planning. On that note, our website is now live, check it out! Thank you again to Prodigitude and all our supporters for making it possible. Citizens and municipal staff everywhere can peruse accomplished livable alley projects, programs, and resources compiled there; including a catalogue of community input to Portland government on needs for livable alley policy since March 2016. “Public rights-of-way are ultimately more livable when their potential for community and environmental benefit – beyond the foundational infrastructure they provide – is actualized in the hands of citizens by the laws that govern and facilitate their enduring improvement." Our project has been keeping active! - 10/11, BFAP organizer Melinda Matson conferenced with the Trust for Public Land to learn more details about their growing and inspiring green alley projects around the country. - 10/19, as a part of our partnership with the HighSchool Environmental Leadership Project through Create Plenty, BFAP was invited to the Environmental Educators Teacher Fair, at the BES Water Pollution Control Lab. It was a forward-looking gathering in setting with significance, where we were able to talk with some community members and potential partners. We were also invited to join a HighSchool Environmental Leadership Project (HELP) meeting 11/15, at CENTER - which happens to be located at the innovative One North Courtyard green alley. The students working with HELP are a real inspiration and motivation to keep working toward more livable and sustainable infrastructure. - 11/4, BFAP sent a proposal to the PBOT Development Permitting Group, urging them to change the current design standards for alley entrance improvement requirements, from entirely impermeable and car-centric design – toward a community and environmentally friendly standard including features such as partial areas of TurfStone and/or rain gardens, reduced lane width, and preservation of trees. Please let the PBOT Development Permitting Group know if you agree with BFAP’s proposal for an alley entrance improvement requirement standard that doesn't facilitate maximum asphalt/concrete, or removal of trees and minimum green space. - 11/7 - 11/28, BFAP sent letters of testimony and inquiry regarding alley programming, especially as it relates to green affordable ADU housing opportunities and livable urban landscapes, to the Portland City Council Commissioners, Commissioner-Elect, Mayor-Elect, BPS Residential Infill Project, and Office of the Director of the Bureau of Planning and Sustainability. Please feel free to reach out to City Council and weigh in, if you see fit! - 12/5, we received a letter from the Director of the Bureau of Planning and Sustainability, supporting our project and encouraging grant-makers to take notice. Thank you very much to the BPS leadership team. During December, BFAP registered as a domestic nonprofit corporation. Nine neighbors adjacent to the Beech-Failing Alley became the project Board of Directors. A five person Advisory Board was also formed featuring community leaders involved in Open School, The Equity Atlas,1000 Friends of Oregon, and the Boise Neighborhood Association; including an advisor holding a Master of Environmental Management degree. We’re lucky to have such a wealth of good people on board. In the next couple months, we’ll continue pursuing grants, exploring community partnerships, and planning for a community event in the summer. Thank you all for your interest and support. 'Very best wishes to everyone this holiday season and in the new year! Check out our end of summer activity! During August, BFAP organizer Melinda Matson communicated with Portland Neighborhood Associations and Coalitions regarding alley policy issues, and gathered community input to represent in dialogue with the city. The Boise Neighborhood Association, the Foster-Powell Neighborhood Association, and the North East Coalition of Neighborhoods in turn wrote letters to Portland’s Director of Transportation on the topic. BPAP also sent input to city planning testimony and to city advisory committees, and started an archive of alley advocacy letters. Thank you Neighborhood Associations and Coalitions! Our professional grant writer hired with funds raised on IOBY continued work on grants applications to fund construction and activation at the Beech-Failing Alley site. When BFAP discovered that funds budgeted and raised on IOBY for topographical survey fell short of market bids, the talented and creative team at W.B. Wells & Associates Inc surveying, engineering, and planning saved the day by making up the difference as in-kind project support. W.B. Wells & Associates has excelled in efficiency, design, and attention to detail since 1924; and we sincerely appreciate their help and expertise in the crucial step of surveying our site topography. Late August, two meetings for owners of properties adjacent to the Beech-Failing Alley were convened, and a number of owner occupants met to share concerns, ideas, and information related to the project. BFAP organizer Melinda Matson connected with three supportive community groups that have special focus on equity: Kairos Academy, the Portland High School Environmental Leadership Project (HELP), and City Repair; to discuss partnerships in working toward a future alley activation community event. These exceptional organizations inspire us, and we’re and thrilled to have the chance to work with them. On Aug 31st, Melinda attended a multi-bureau meeting at city hall, including other project advocates, PBOT City Engineer and Development Review Manager, and other key staff from PBOT, BES, BPS, and the Mayor's office. While the meeting mainly addressed paving materials used in green alley design, Melinda pushed forward in introducing issues broached by the Neighborhood Associations’ and Coalition’s input, and made a good case for the need for more comprehensive discussion of policy issues. In the following weeks, project liaisons in the Mayor's office began work to try to convene a more comprehensive meeting focused on alley policy issues. In September, we began seeking project advisory board members, and we’re happy to have several admired community organizers already sign on. In addition, the Beech-Failing Alley Project was accepted to receive administrative 501c3 umbrella services by North Portland Community Works, which helped kickstart the North Portland Tool Library – a unique community resource, and are fiscal sponsors of the innovative and inclusive Harper's Playground at Arbor Lodge Park. We're really excited to have such an outstanding local organization facilitate our grant applications for funding. While our project keeps moving with support and progress, challenges also persist. It is possible the rising pressure of impending development adjacent to the Beech-Failing Alley, and current PBOT policy for standard required alley improvements triggered by new developments, could impede the scope of our goals on-site before funds can be raised for green alley construction. We’re working hard to waste no time in continuing building on your support, and to inspire new policy. You can add your voice by asking PBOT leadership to put greener, more livable, standard design options for alley improvements within Portlander’s reach. PBOT is now on NextDoor, where they take messages from the community! Thank you as always for your support. Enjoy autumn, and check back late October for another project update! There's continuing positive project news since the close of our seeds fund campaign and beginning to move forward. Barg Law, providers of experienced counsel, with the mission to provide practical, cost-effective, thorough, and responsive advice to clients on real estate and business matters, have kindly stepped up to contribute funds for a portion of initially budgeted professional grant writing services which were not raised during the campaign. This is a big help. Thanks Barg Law! Professional grant writer Lyndsi Lambert has been hired to complete BFAP grant applications for 2016. Lyndsi has over 10 years programming experience in Project Management including expertise in grants administration. She's recently relocated from Baton Rouge LA, where she successfully authored, coordinated, and awarded grant programming with special focus on children's health, food equity, and sustainability; in Parks and Rec, mayoral initiatives, and the public school system. She currently works with Health Care Without Harm, global champions for environmental health and justice. We're proud to have Lyndsi on our team. If BFAP succeeds in raising funds to move forward with construction at the Beech-Failing Alley site, our project has been pledged valuable in-kind assistance drafting a construction contract and development agreement, from the outstanding global law firm Holland & Knight, with a strong company heritage of business and civic leadership, and community support. This is a major pledge. Thank you community partners Holland & Knight! Furthermore, if BFAP secures funds and permitting for pervious paving of the Beech-Failing alley, our project has been offered another substantial pledge of thoughtful in-kind contribution from trusted local company Mutual Materials, an industry expert that helps people build better, more inviting communities by providing appealing hardscape and masonry products that stand the test of time. Thank you Mutual Materials! Meanwhile, BFAP is working earnestly at advocacy for relative policy, including recent networking with Portland Neighborhood Associations and an upcoming meeting with other community organizers and key persons in related city bureaus. Check back in September for an update! Help Muriel Support Enlace This Spring! Help Lauren Support Enlace this Spring! City Repair's Mobile Tea-Bike, the T-Crab!